The Triumph Hurricane X75 was a bit of a mongrel from the word go. Originally a BSA design, with very sleepy, Triumph Bonneville-esque style, the honchos felt it was way too conservative for American tastes. Famous designer Craig Vetter was tasked with a stylistic redo, and the resulting bike was different, to say the least, with a very 60’s chopper style and a distinctive triple exhaust slung along the right side of the bike. 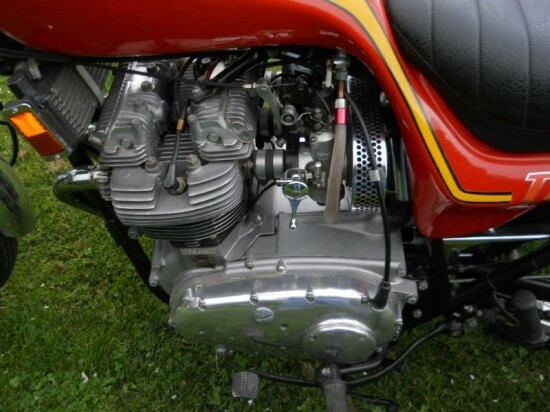 When BSA went under, 1,200 engines were put aside and the bike was rebranded as a Triumph. 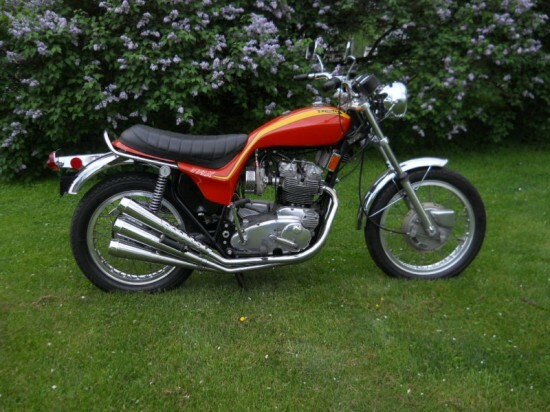 This is my own personal bike that I have owned since 1973. Each Dealer was allotted one per Dealership and it was never sold – it was only used by me on my Dealer Plate – never registered. Time to retire and let it go. It has been stored in my heated showroom and serviced and babied for 40 years. This bike has NOT been painted. You may feel free to call me at any time to learn more about this bike or to make arrangements to see it. Ed 413 443 9407. The buyer must make arrangements to pick it up in Massachusetts or have a shipping company handle it for you. It must be paid via wire transfer from your bank to mine before it leaves my possession. 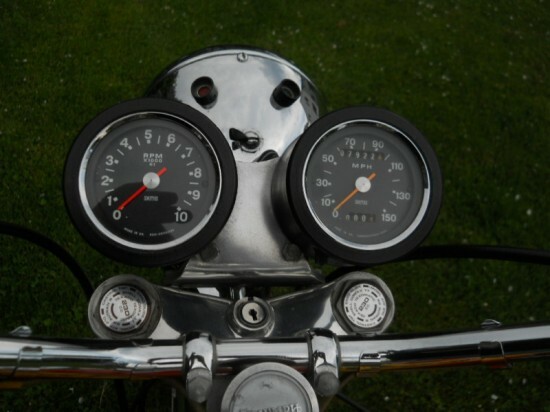 This motorcycle is one of less than 1200 produced – Matching Numbers. Side stickers are custom but I have NOS Original black stickers for the buyer. Three cylinder motorcycles in general are pretty neat sounding machines. Not quite as brutal as a thumping twin or single, not as smooth or refined as a four [or six! ], triples make a very raw, iron-fist-in-a-velvet-glove kind of roar. 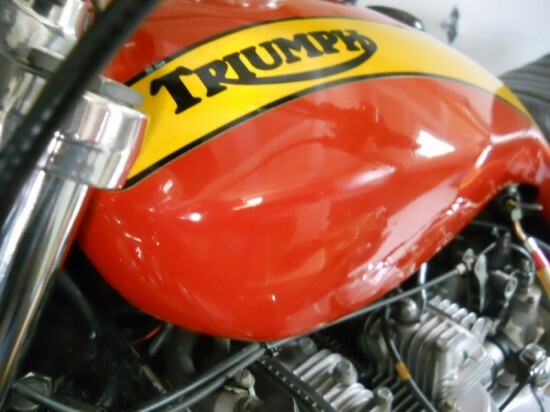 This clip [not the bike for sale] should give you a good idea what I mean: Triumph Hurricane start up and ride. A very expensive bike but, if you’ve got a Triumph-sized hole in your collection and want something pretty wild and very cool, this might fit the bill.